Greetings fellow crafters! It’s Ashley D. here for my first official blog post! So excited to join the BRI Design Team this term, and I look forward to sharing my fun crafty projects with you over the next few months! First up is a simple pick-me-up card I created for a friend having a rough time right now. 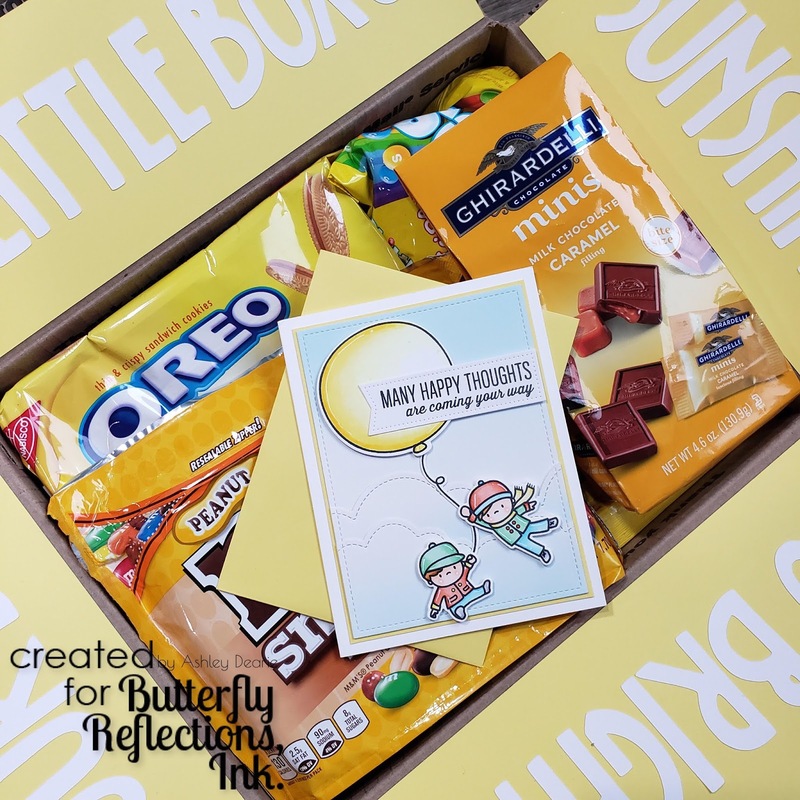 I sent it along with a decorated “sunshine box” full of bright yellow surprises to cheer her up. 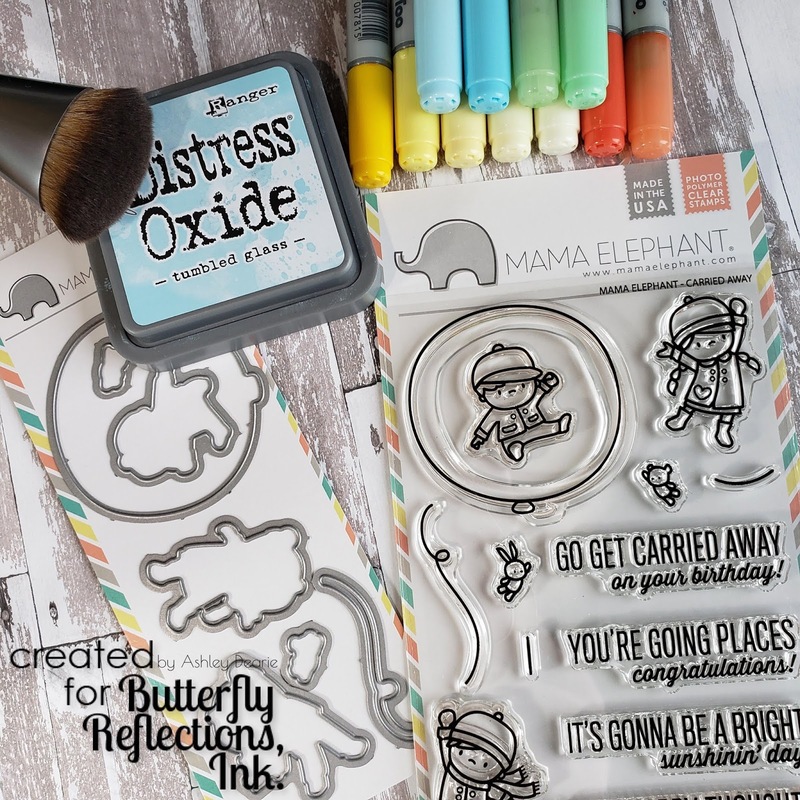 For the card, I chose to use Mama Elephant’s Carried Away set, and coordinating dies, for its uplifting sentiment. As a mom of two boys, it’s one of my favorite sets because it includes two little boys in addition to a girl. And it’s perfect for winter without being Christmassy, especially with the older boy wearing a scarf. First, I stamped both boys, the balloon, and string, with Memento Tuxedo Black. I prefer this ink because it works flawlessly with Copic markers. I then colored all three images with Copics, and if memory serves me correctly, I used Y000, Y00. Y02, Y11, and Y08 for the balloon; R02, R05, Y11, Y02, G000, YG41, B00, BG01, N1, and N2 for the clothes; YR31, YR12, and E97 for the hair; and E000, E00 and E93, for the skin and cheeks. 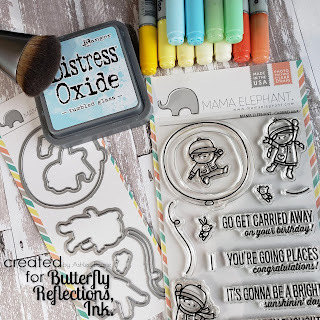 For a little dimension, I added a few white highlights with a Gelly Roll Classic Gel Ink 08 pen. To set the scene of the boys flying away with good wishes, I created a sky background; first by single-color ink blending Distress Oxide Tumbled Glass onto Bristol Smooth Cardstock, then die cutting a stitched rectangle and clouds (Lawn Fawn Small Stitched Rectangle Stackables & Lawn Fawn Puffy Cloud Borders). Then layered them together with a hint of yellow cardstock. 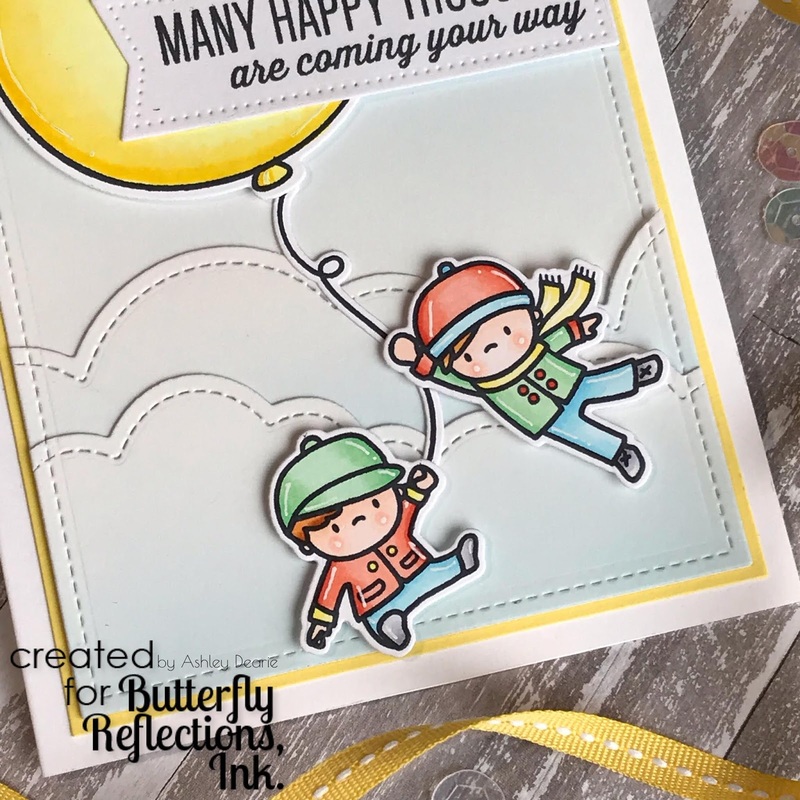 Finally, I stamped and die cut the included sentiment, and attached it, the boys, and balloon, with foam adhesive. Hope the recipient loves it as much as I enjoyed creating it! Thank you for stopping by and see you next week!